Our wedding day is meant to be one of the most important days of our lives, especially if you’re a woman! Don’t get me wrong, the special day is important for both parties, but for the woman, it’s the chance to put on a big, poofy, gorgeous dress and feel more beautiful than you’ve probably felt for the whole of your life! A wedding takes a lot of organisation, there’s making sure the seating plan doesn’t offend any of the guests, the food, the drink, deciding on the best man…the list is endless! Yes, even with wedding dresses, sometimes…less is more! 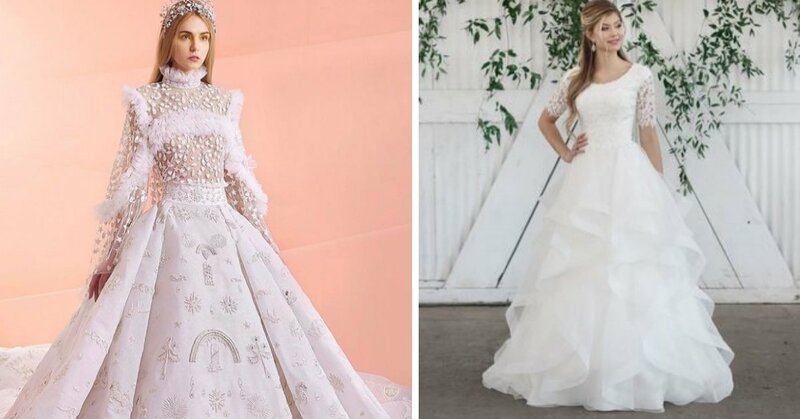 So, if you’re looking for some modest, yet still gorgeous wedding gown ideas…or just want to fawn over some subtle, pretty dresses for a few minutes, then keep reading, you’re in for a treat! This is absolutely stunning, subtle, pretty and elegant…and if you don’t want a long train, but also kinda do want a long train, then this gorgeous dress definitely provides a happy medium for you! How’s this for a real life fairytale!? Modest, with an excellent design that has somehow managed not to make her look like a toilet roll holder! & The lace around the edging is a beautiful touch!